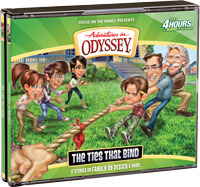 Beginning on September 6, 2014, a brand-new season of Adventures in Odyssey will make its way to radio stations and online with a 14-part episode: The Ties That Bind. This special collection of episodes explores God’s design for family. It deals with several big issues in our culture today. Currently, Odyssey Adventure Club members can access the entire multi-part series via the website and mobile app. For those of you who don’t have a membership, the digital download will be made available on iTunes and in the Focus on the Family Store (CBD) in September. The CD copy will follow this October, and I’m sure fans will be eager to add this to their growing Odyssey collections. And, having grown up listening to Adventures in Odyssey the old-fashioned way from week to week (on the radio), I highly recommend you follow the adventure that wat if you haven’t heard the series yet. You can see a complete list of upcoming episodes at our Weekend Schedule along with summaries. To learn more about Album 58, visit our product page. Update: The digital download of Album 58 is now available, with the CD copy to follow in October. Read our news story regarding the digital release. Stay tuned, fans. More news is on the way!